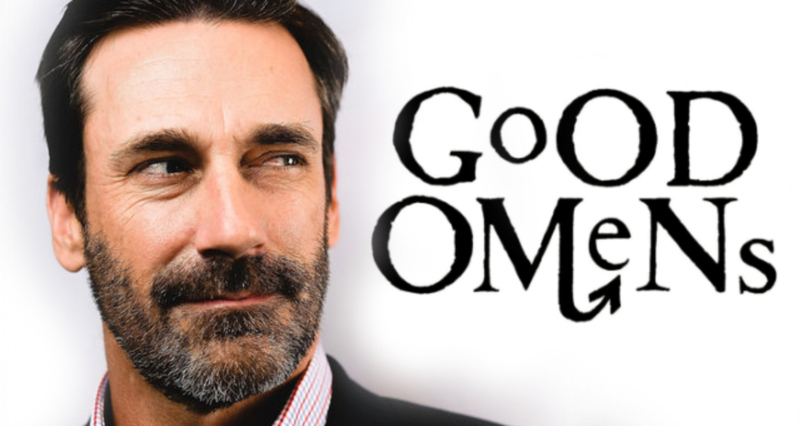 October 02, 2017 – Amazon and BBC Two today announced Emmy and Golden Globe award winning actor Jon Hamm (Mad Men, Baby Driver, Bridesmaids) will be joining the cast of Good Omens, in the role of the archangel Gabriel - the primary messenger of God. The six-part television adaptation of the best-selling novel by Neil Gaiman and Terry Pratchett is currently in production and will be released by Amazon Prime Video in over 200 countries in 2019, exclusively for Prime Members. It will be followed by a run on BBC Two in the UK. Good Omens will launch globally on Prime Video in over 200 countries and territories in 2019 including in the UK, where it will also air on BBC Two at a later date. BBC Worldwide distributes rights for Good Omens internationally, after the series premiere on Prime Video. The series will be brought to the screen by the highly acclaimed director/executive producerDouglas Mackinnon, whose credits include Knightfall, Dirk Gently, Doctor Who, Outlander and the standalone Victorian episode of Sherlock: The Abominable Bride, winner of the Primetime Emmy Award for Outstanding Television Movie last year. Neil Gaiman is the award-winning author of books, graphic novels, short stories, and films for all ages, including the Oscar-nominated Coraline. Some of his most notable titles include the ground-breaking Sandman comics series, The Graveyard Book (the only book ever to win both the Newbery and Carnegie medals), and The Ocean At The End Of The Lane, the UK’s National Book Award 2013 Book Of The Year. The television adaptation of his novel American Gods was released in 2017 and the film adaptation of his short story How to Talk To Girls At Parties follows later this year. Born in the UK, he now lives in the United States. · Prime Video: Thousands of movies and TV shows, including popular licensed and self-published content plus critically-acclaimed and award-winning Amazon Original Series and Movies from Amazon Studios like Transparent, The Man in the High Castle, Love & Friendship and kids series Tumble Leaf, available for unlimited streaming as part of an Amazon Prime membership. Prime Video is also now available to customers in more than 200 countries and territories around the globe at www.primevideo.com. About AmazonAmazon is guided by four principles: customer obsession rather than competitor focus, passion for invention, commitment to operational excellence, and long-term thinking. Customer reviews, 1-Click shopping, personalized recommendations, Prime, Fulfillment by Amazon, AWS, Kindle Direct Publishing, Kindle, Fire tablets, Fire TV, Amazon Echo, and Alexa are some of the products and services pioneered by Amazon. For more information, visit www.amazon.com/about and follow @AmazonNews.